Astronomical spring is marked by the vernal equinox which arrived more than a week ago on Tuesday, March 20, at 12:15 p.m. EDT to be precise. To be less precise and more provocative, I mark "entomological spring" to be when overwintered Eastern Tent Caterpillar (ETC) (Malacosoma americanum) moth eggs hatch. That's why I always collect a few egg masses in late winter and hold them outside (in the shade) to monitor for this supernal event. It began happening today at around 12:00 p.m. I received an e-mail message last Sunday (March 25) from our "BYGL Early Warning System" (a.k.a. 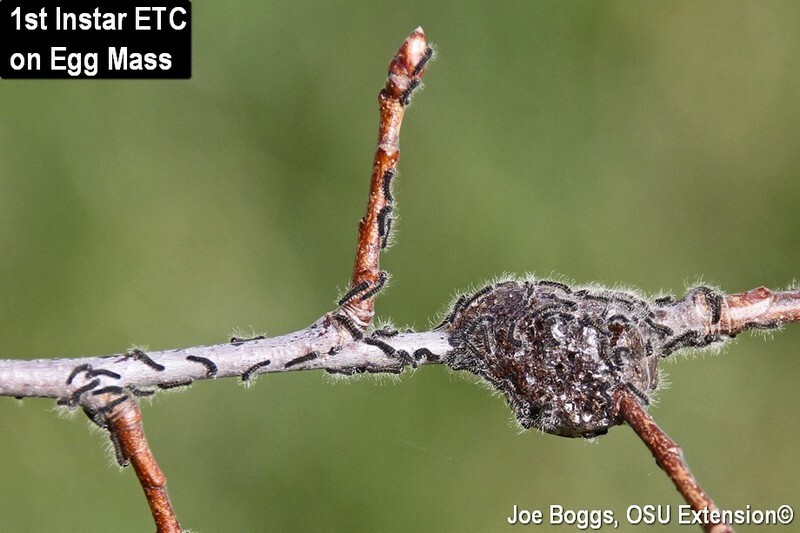 Larry Hanks, Pampered Properties, Lexington, KY) reporting that overwintered eastern tent caterpillar ETC eggs began hatching in Georgetown (Scott County), KY. Larry has been reporting this important life-cycle event for around 20 years; it's always interesting to compare notes. His observation was also highlighted in the March 27th edition of the Kentucky Pest News, another great early-warning resource for Ohioans. You can sign-up for an e-mail subscription by clicking on the hotlink under "more information" below. ETC spends the winter in shiny, blackish-brown egg masses wrapped around twigs on their host plants. A close examination will reveal that the eggs are encased in a structure that resembles bubble-wrap. Indeed, the empty cells surrounding the eggs may provide some winter protection. The accumulated Growing Degree Days (GDD) that predicts ETC egg hatch is 92 and full bloom of Callery pears is usually a pretty good phenological indicator although it's lagging behind a bit this season. The caterpillars are accomplished tent-makers; thus their common name, and they produce highly visible silk nests in branch forks. They begin producing silk nests immediately upon hatching from eggs. Indeed, egg-hatch may be revealed by observing the tiny, hairy first instar caterpillars clinging to small, silk nests that surround their egg mass. The caterpillars prefer to feed on trees in the family Rosaceae, particularly those in the genus Prunus, such as cherries. They will also occasionally feed on ash, birch, maple, and oaks. The caterpillars are covered in short; grayish-white hairs and have a distinct, unbroken white stripe down their backs that becomes apparent during the second instar stage. ETC is capable of causing serious stress to their host trees; particularly newly planted trees. Leaves lost to caterpillar feeding this spring must be replaced using energy stored from last season. Small nests can be eliminated digitally using five-fingered "smash and/or smear" techniques. Less hands-on methods include applications of the naturally occurring bacterium, Bacillus thuringiensis serotype kurstaki (Btk), applied to early instar stages, as well as standard insecticides labeled for general caterpillar control. There is one generation per season with most of the defoliation occurring during the spring. ETC is of particular interest in Kentucky because of the link between hairs on the caterpillars and Mare Reproductive Loss Syndrome (MRLS). The syndrome produced an estimated economic loss to the thoroughbred horse industry of $336-$500 million in 2001. The unique pathogenesis was untangled through diligent scientific sleuthing by scientists at the University of Kentucky. I remain convinced the entire story should be gathered into a book; it would make for some great reading.